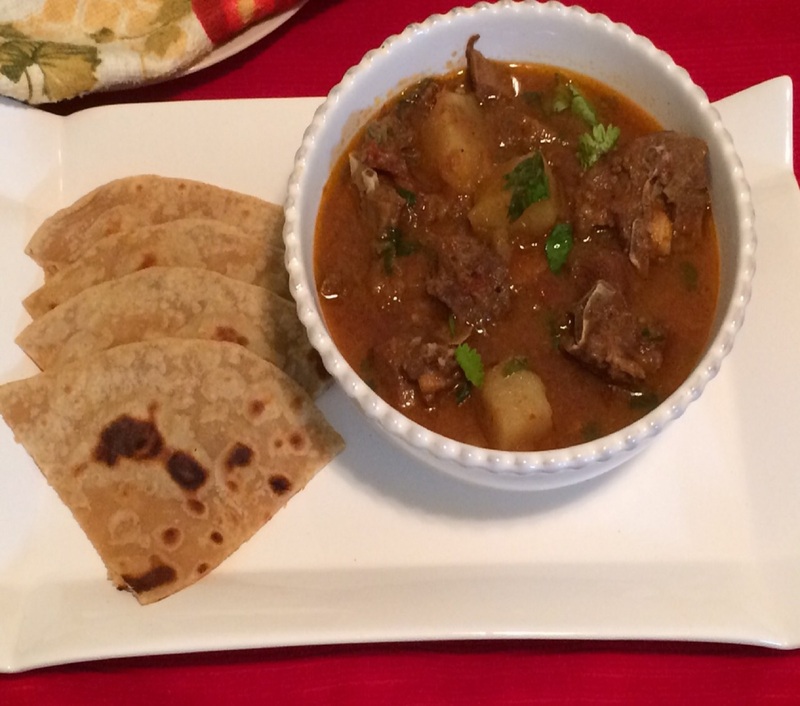 Aloo Gosht Shorba is another popular Indian non-vegetarian dish in which pieces of lamb/mutton is simmered with potatoes to give a stew-like shorba or gravy. It is a classic winter comfort food in India and can be paired with any Indian flat-breads like naans,parathas, rotis or flavored steamed rice like jeera rice. I once served it with homemade dinner rolls and it was a total hit. I can never forget the childhood days when my home was filled with aroma as my mother simmered a large pot of this stew and I as a child patiently waited until the lamb cubes passes the doneness test by poking with knife. 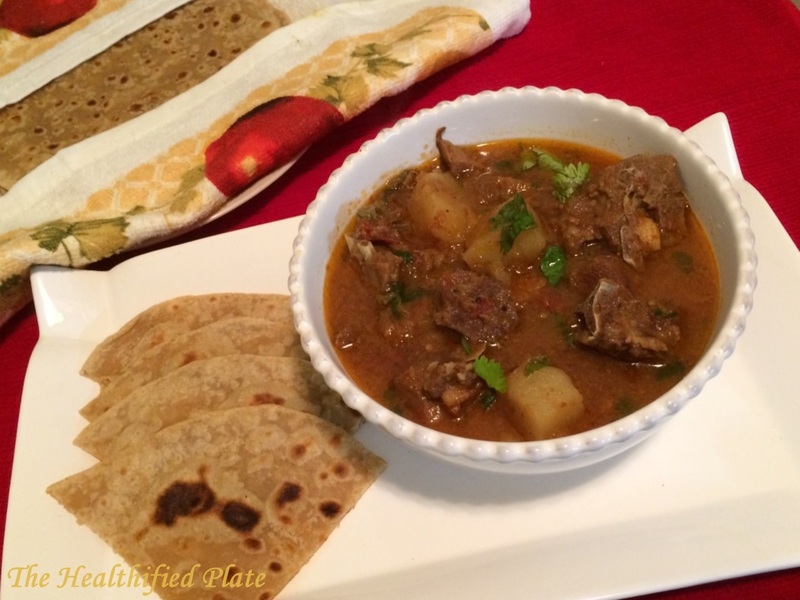 I loved the melt-in-mouth pieces of lamb and potatoes with aptly spiced shorba/stew over the stack of parathas. 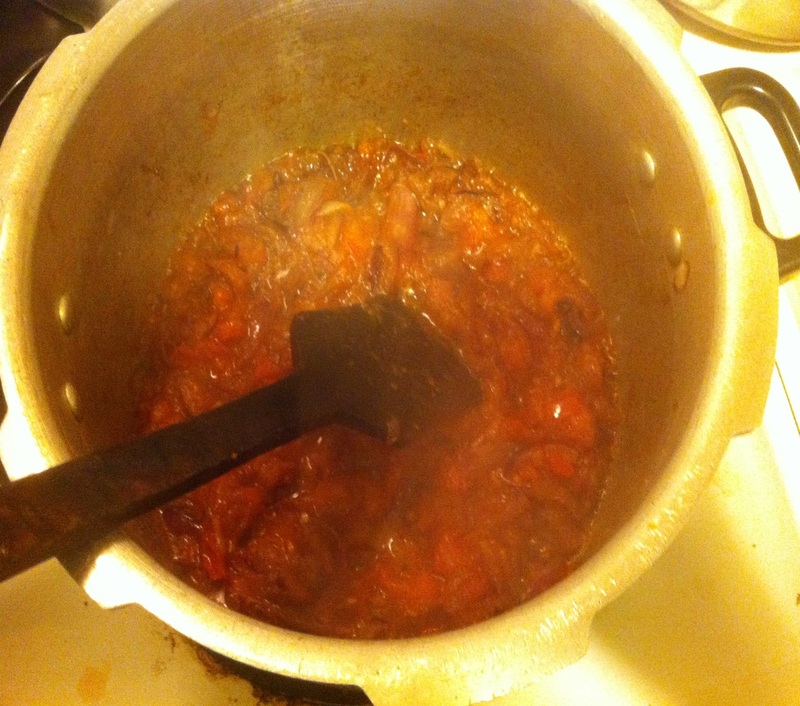 Traditionally, the stew is made with onions and spices, but here I added few tomatoes for nice color and that sweet and sour taste it gives. I freshly made the spice paste/masala but you can also use the store-bought masalas like garam-masala, coriander and cumin powder. The best thing I like about it is we need not add any nut paste to thicken the gravy. I made it in pressure cooker as I was in a hurry but simmering this in a pot for 45-50 minutes gives the best results. 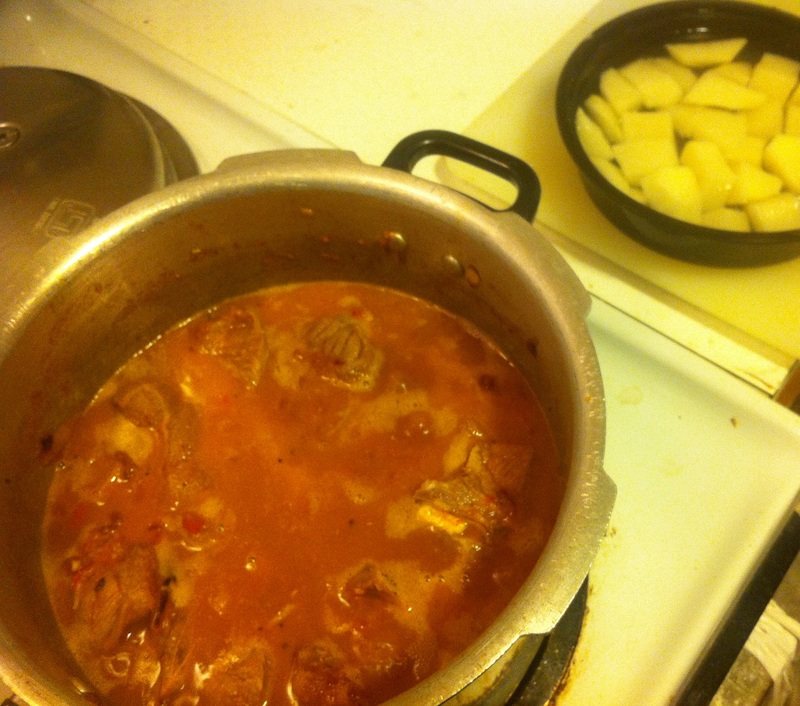 It is a simple recipe in which onions and tomatoes are cooked with spices and lamb is added to simmer until done. Enjoy this spicy and piping hot bowl of Aloo Gosht Shorba with Indian flat-bread or steamed rice for a comforting meal. Soak all the ingredients (except ginger and garlic) in spice paste list in 1/4 cup of water for 15 mins and grind to a smooth paste (Drain the water to grind it finely). Add ginger and garlic and grind again to a smooth paste by adding little water. Marinate the washed and cleaned lamb pieces with half the spice paste and reserve the other half of the paste. Heat oil in pressure cooker or large non-stick pot and add bay leaves and let it splutter. Add the sliced onions and saute for 10-15 mins until golden. Add the remaining spice paste, salt, turmeric powder, red chili powder and saute until raw smell goes off. 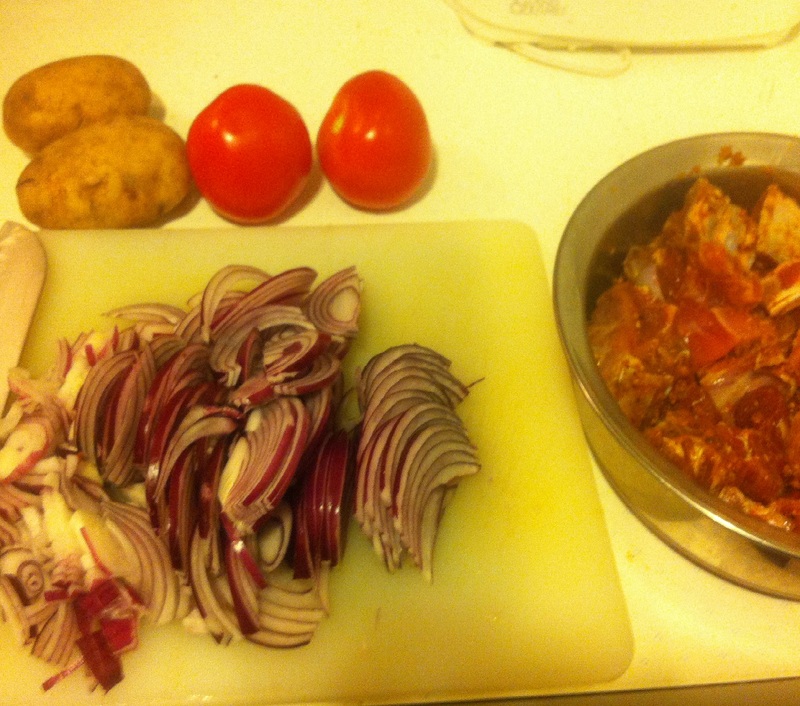 Add the chopped tomatoes and cover cook for 5 minutes until they turn mushy and oil released at the edges. Add the mutton pieces and mix well until mutton is lightly brown, for 5 mins. Add 1.5 cups of water, bring to boil and put the lid and whistle on. If cooking in pressure cooker cook for 3 whistles on medium-high heat and if cooking in pot, cover cook for 40 mins until the mutton is 80% cooked. Add the potatoes and simmer the gravy. Add little water if the gravy seems thick. Cook for 15-20 mins and adjust the consistency to your preference by adding water or cooking on high heat. 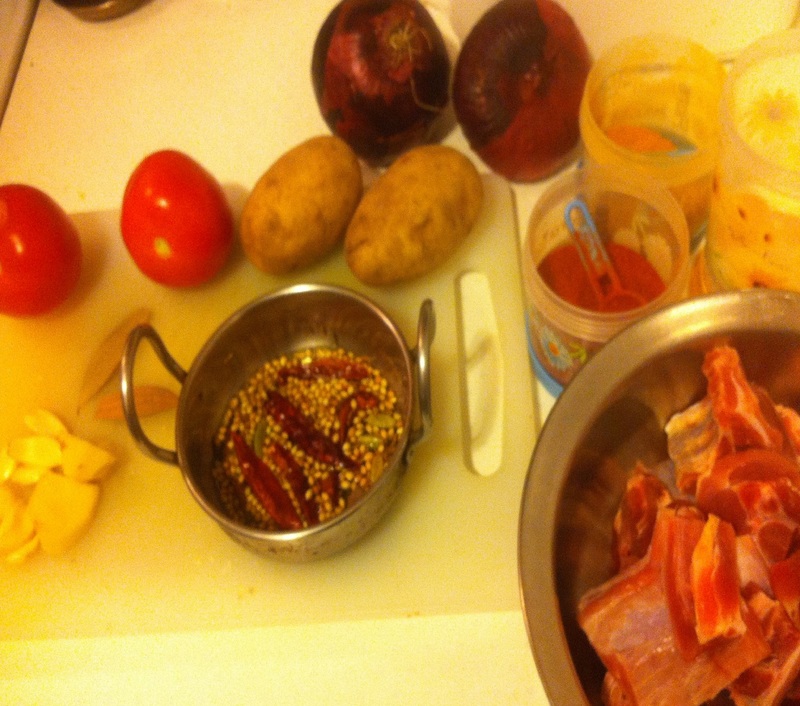 Cook until the potatoes and lamb are well done and garnish with coriander leaves.